Smurfs Figures & Toys for sale at Toy Dreamer. The Smurf Store. Postage in Australia - $9 Flat Rate! 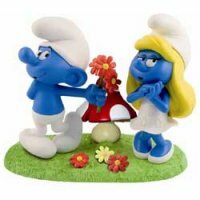 This is a page dedicated to the Smurfs that we aren't intending to get into stock again, are too hard to find or are just too expensive for us to lay our hands on. We're leaving the smurfs up here as a reference and price guide for all you budding collectors out there so that when you do find that rare smurf, that we couldn't, you can hopefully reference some smurfy information on it here. If we do come across the smurfs on this page, we will of course re-list them on their proper page for sale, but until then, the smurfs sit here, in our little smurfs museum. Of course there are some smurfs we're listing on this page that can be obtained, but we just choose not to list them as how many smurfs is too many smurfs? We plan to grow this list of Smurfs over time, so check back from time to time to see what smurfs have been added.